Dubai, UAE, April 09, 2019: The Delancey watch is named after one of the most historic streets in New York City. 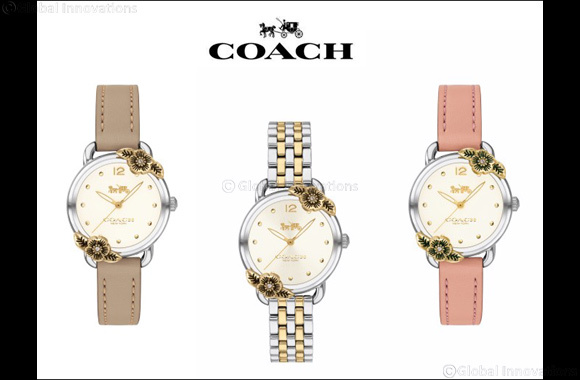 The stainless steel design is accented with a Coach prairie-inspired Tea Rose motif. Case Size available in 28 mm. Quartz Movement. 3H. Stainless-steel. Gold plated case accents. Water resistant 99 feet. Two-year limited warranty. Manufacturedby Movado. Coach Time Piece - Defining Modern Luxury. Approaching design with a modern vision, authenticity and innovation. The Coach Park collection is priced between AED 1,195 - AED 1295 and is available at all Rivoli stores and Hour Choice across the UAE.